The ecology, behavior, and conservation of Iberian wolves in human-dominated landscapes, Galicia, NW Spain. In Galicia, wolves live in a human-dominated landscape with significant values of human, settlement and road densities along with a high level of habitat transformation and degradation, mainly due to agriculture, forest and livestock practices. Under this scenario, one of the main goals of the Action Plan for Wolves in Galicia approved in 2009 is 1) to improve our knowledge about the ecology and behaviour of this predator in human landscapes where the conflict between wolves and people has been evident for a long time and where the conservation of this species may be influenced by several other factors such as habitat degradation or food availability and 2) to understand the behavioural response of this population to the current increase of human infrastructures, particularly wind farms in mountain areas. In this regard, the integration of the behaviour of wolves into the decisions adopted by stakeholders is an important step to ensure a management adapted to this particular context as well as the proper conservation of this large predator under the current scenario of global change. We are determining habitat selection, spatial use, activity patterns, intraspecific interactions, parameters for the population such as reproductive success, productivity and survival, and dispersal behaviour among others. We are particularly interested in the behavioural response of wolves to the exponential increment of wind farms in this area during the last years. 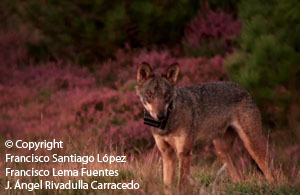 For the progress of the research work, since 2006 and supported by the Xunta de Galicia as well as several wind energy companies (DESA and GAMESA) we have equipped 20 wolves from different packs with two models of GSM-GPS collars from TELEVILT (TELLUS BASIC T3H and T5H; all models include drop-off units) depending of the size and the age of the animals.